Ovarian cancer is one of the most common and lethal gynecological malignancies. The diagnosis of ovarian cancer is often at an advanced stage. Accumulated evidence suggests that long noncoding RNAs (lncRNAs) play important roles during ovarian tumorigenesis. In this study, using the lncRNA-mining approach, researchers from the Chinese Academy of Sciences and Fudan University analyzed lncRNA expression profiles of 493 ovarian cancer patients from Gene Expression Omnibus datasets, and identified a signature group of seven lncRNAs (BC037530, AK021924, AK094536, AK094536, BC062365, BC004123 and BC007937) associated with patient survival in the training dataset GSE9891. 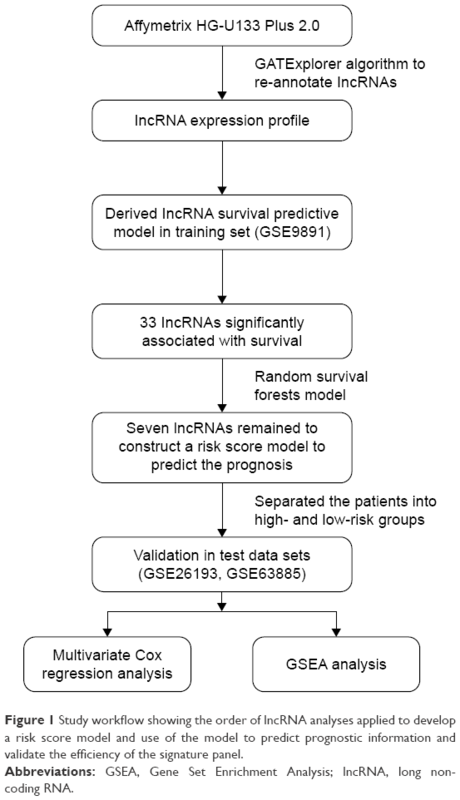 The researchers also formulated a risk score model to divide patients into low-risk and high-risk groups based on the expression of these seven lncRNAs. They further validated the predictive power of their risk score model in two other datasets, GSE26193 and GSE63885. Their analysis showed that the seven-lncRNA signature can serve as an independent predictor apart from Federation of Gynecology and Obstetrics (FIGO) stage and patient age. Combined, all these findings strongly support that the seven-lncRNA signature can serve as a strong prognosis biomarker. 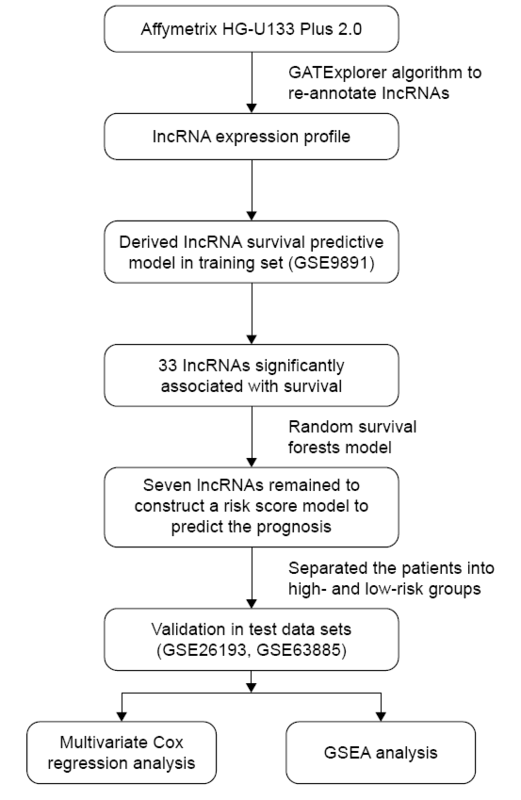 Study workflow showing the order of lncRNA analyses applied to develop a risk score model and use of the model to predict prognostic information and validate the efficiency of the signature panel.